Giri Trading Agency Pvt. Ltd. (a one stop shop for all religious items) initiated a book donation drive for the underprivileged children studying in IDF Bal Gurukuls. `Customers came forward in good number, purchased choiced books for children and donated for the cause', expressed Mrs. Sharada Prakash, Director of Giri Trading. `We have been supporting various educational and sponsorship programmes of IDF for some years now and we feel happy that through the good offices of our customers we could reach-out a number of students in IDF Bal Gurukuls', said Mrs. Sharada said with a smile as she handed over the `bulk of benevolence' to Dr. Narayan Iyer of IDF. IDF thank Giri Trading Agency and its team for the excellent social responsibility initiative. Dr. Ganesh Raja, Director, ITM Business School, Kharghar, Navi Mumbai and Prof. Richa Bhandari and Prof. Roopam Gosain visited IDF office on 30th January, martyrdom day of Mahatma Gandhi, which is also observed as Anti-Leprosy Day. Dr. Narayan B. Iyer, national co-ordinator of IDF apprised the team on various CSR initiatives/ projects given to the interns of ITM in IDF projects. `We are very happy with the performance of ITM students who take keen interest in learning many social projects. IDF gives an all round development training during the internship and students feel like getting associated with the NGO even after the internship', Dr. Iyer said. Dr. Ganesh Raja explored the possibilities of involving ITM students in IDF's projects in different states of India. We should come together in drawing a long term plan where the social projects become more meaningful, he added. Dr. Narayan Iyer presenting the recently released book Hope on the Horizon - Life and Times of Dr.ARK Pillai to the ITM team. ITM has been partnering with IDF for the CSR initiatives for the past three years. TEAM - Together Everyone Achieves More. Walking through the hilly terrain in Kotagiri region of the Queen of Mountains, The Nilgiris in Tamil Nadu, one will reach a place called Kolikarai surrounded by panoramic beauty of the nature. Nilgiris Adivasi Welfare Association (NAWA) is running an anganwadi in Kolikarai and IDF reached the place offering an concept of Bal Gurukul for the students in aganwadi school. Indian Development Foundation (IDF) in collaboration with Nilgiris Leprosy Eradication Scheme (NILES) launched Nilgiris Bal Gurukul at Kolikarai on 27th Jan. 2010. IDF bring smiles on many lives. Rev. Sr. Irudaya Mary, Principal of St. Henrietta's English Primary School, Bangalore and her team lent excellent support for IDF's leprosy/ TB programmes. Every student in the school took keen interest in the social responsibility programme, created awareness on leprosy and tuberculosis and gave a handsome contribution to Indian Development Foundation. Dr. S.Franklin, Manager-SR, IDF congratulated the schoolteam for excellent social participation and thanked them for their continued support. Students were cheered up as they received their participation certificates and mementoes from IDF. World TB Day 2010 campaign will highlight innovations in the global fight against TB. The 2010-2011 World TB Day campaign, On the move against tuberculosis: Innovate to accelerate action, was launched in December at the opening ceremony of the World Conference on Lung Health of the International Union Against Tuberculosis and Lung Disease. "We have made considerable progress. But the evidence points to an urgent need to do more, do it better and do it faster," said Dr Marcos Espinal, Executive Secretary of the Stop TB Partnership. "The year 2010 marks the halfway point for the Global Plan to Stop TB. It is clearer than ever that we will not achieve our targets unless we find new and innovative ways to stop TB—including stepped up research to find new drugs, diagnostic techniques and a new vaccine; and new approaches to helping people access effective TB treatment," said Dr Mario Raviglione, Director of the Stop TB Department of the World Health Organization. World TB Day is held each year on 24 March. Gayatri Ananth, Indira Chatterjee, Glenson Sequeira and Aakarsh Yardi from Xavier Institute of Management and Entrepreneurship (XIME), Bangalore completed their internship with Indian Development Foundation. The 21-day internship for the 1st batch of XIME students with IDF was full of activities and projects. The students covered health, education and development projects of IDF. The interns had specially taken up education project for the drop-outs and student sponsorship programmes. They did their best in their "Socially Useful and Productive Activity” (SUPA). IDF appreciates the social inclination of these young buddies and congratulates them for their wonderful social responsibility. Mr. R. Girish, Trustee-IDF, presented Certificate of Appreciation to the students as they completed their project today. Dr. Pillai and Dr. Iyer wished them well in their endeavours. IDF team also thanked XIME for selecting IDF as one of their NGO projects. "We have learnt a lot during our internship with IDF, particularly the human face of sufferings and individual's responsibility towards the welfare of society were revealing. Though our internship is complete now, but we wish to be part of IDF as Social Ambassadors and serve the society during our spare time, said Gayatri, Indira, Glenson and Aakarsh with confidence and smile. 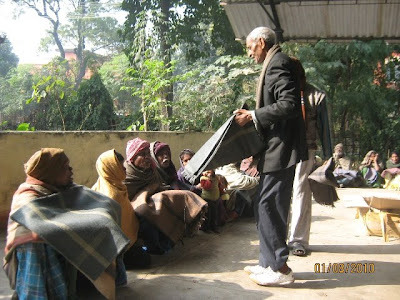 Blanket distribution at Gandhi Kushthashram, ARA, Bhojpur, Bihar. An act of kindness !!! A long way to go....HELP the needy. Process is important while the outcome is not in our hands. There may be failures, let's not get obsessed. We need to learn to have humility when we are in the social work, said Dr. Sudarshan. Dr. H. Sudarshan, Hon.Secretary, Karuna Trust - VGKK, BR Hills visited IDF Mumbai on 9th Jan 2010 and interacted with the students of Xavier Institute of Management and Entrepreneurship (XIME-Bangalore) and Institute of Technology Management Business School (ITM Kharghar, Navi Mumbai). A group of ten students - Gayathri, Glenson, Aakarsh and Indira from XIME and Tejpreet, Pallavi, Neha, Dattasen, Karan and Ranjita from ITM - interacted with Dr.Sudarshan on the current social scenario in India. The students also got an insight into the workings of Dr.Sudarshan for the uplift of the Soliga tribes in BR Hills in Karnataka. Dr. Sudarshan touched upon various social issues including corruption, medical ethics and social securities. He said while technology can transform the country, management is also important. The B-students should come forward and help in making a socio-business model for the NGOs. Karuna Trust has been recently taken by a B-school as a Model. These need to be replicated. Dr. Sudarshan shared his work experiences in India particularly in BR Hills, Arunachal Pradesh, Gujarat and Andhra Pradesh. It was a fantastic learning experience to interact with such a great social reformer of India, the students expressed their with happiness. The following is the list of interns from various institutes who joined IDF for their social responsibility programmes. We guide them, they just do it.......All in social interest. We engage the students in health, education and development projects. They are our greatest human resource. A lot to learn over an internship with IDF. join IDF and feel the difference !!! 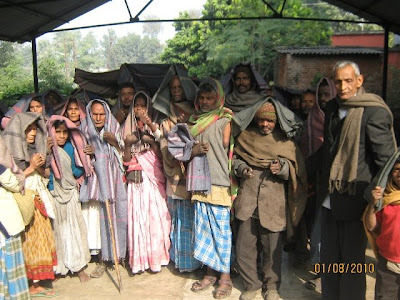 Mr. Rishi Jaiprakash and Ms. Bhawna Prabhakar donated 150 number of blankets for distribution to leprosy patients in Rajasthan and Bihar. IDF thank Mr. Rishi and Ms. Bhawna for their valuable support in providing warmth to the patients suffering from cold waves. Indian Development Foundation (IDF) ushered the New Year 2010 with a difference by celebrating festive occasion with the poor and the needy at Sumanahalli. Samabandhi Bhojanam (common feast), presentation of sweets and dress materials and musical events marked the New Year day celebrations at Sumanahalli Centre in Bangalore. Summanahalli is located at the outskirts of the city, on the Magadi road in Bangalore. IDF team visited Sumanahalli Centre, a social hub for leprosy, tuberculosis, HIV/ AIDS victims and physically challenged children, on the New Year day to express greetings and share joy and happiness with the less privileged. Eleven year old Nishchith, young social Ambassador of IDF, studying in class six in Kendriya Vidyalaya MEG & Centre, offered the musical fiesta to the joy of the disabled and victims of leprosy and HIV/AIDS. Talking on the occasion, Nishchith stressed the importance of care and compassion along with medical treatment. Fr. George Kannanthanum, Director, Summanahalli, thanked IDF for its commendable support and sought the co-operation and involvement of similar NGOs in good measure. He was happy to announce that the first set of new houses, constructed by the initiative of Summanahalli towards the rehabilitation of flood victims in North Karnataka, will be inaugurated on 3rd January 2010. Dr. S. Franklin, Mr. C. A. Mathew and Mr. Samuel Vincent from Indian Development Foundation appreciated the yeomen service of Summanahalli Centre and felt proud to be partnering with the project for noble causes.People from all walks of life attended the function in good number. While the occasion brought joy to the inmates, the participants went with the satisfaction of starting the New Year by reaching out with love and care to the sick and needy. The function also helped in removing the social stigma on leprosy and HIV/AIDS.